Your homeschooling high schoolers need to build their literature & composition skills. If they have had a little experience with literature guides and high school-level writing, Intermediate Guide to High School Literature & Composition: Part A is a great way to continue! This one-semester guide (easily followed the second semester by Intermediate Guide to High School Literature & Composition: Part B- coming in fall 2015) will extend your high schooler’s language arts skills. Intermediate Guide to High School Literature & Composition is a downloadable text that will inform and inspire your homeschooling high schoolers without boring or burdening them with busywork. 7 Sisters Literature Guides philosophy is “don’t kill the book” AND make it adaptable (so a variety of teens in your home, from average to honors, can earn the credit level they need for their transcript). The guides contain brief background information, important literature terms and themes, vocabulary, comprehension and critical thinking questions. Composition Guides contain concise 15 minute daily lessons that teach half of the writing skills needed in second year high school (or advanced 9th graders). The lessons contain information and instruction and assignments. Both the Literature Guides and the Composition Guides are excellent for self-instruction and are favorites with co-op classes. This delightful short-story form will develop your homeschool high schooler’s love of writing and creativity while tweaking some skills they will need for other college-level writing. The topics covered include character development, basic storyline development, basic story conversation format, using dialect, rubric for editing and grading. This user-friendly, no busywork Composition Guide will help your homeschool high schooler learn the fundamentals of writing a cohesive essay and to edit it well. Topics include persuasive essays, compare/contrast essays, literary analysis , editorial/letter to the editor, and optional SAT essays. Written to accompany American author Harper Lee’s beloved 1960 novel, this 17-page literature study guide helps you get the most out of To Kill a Mockingbird. Instead of attempting to examine every element of a book on the first reading, our study guides choose two or three respected literary devices and use them as a focal point. This study guide focuses on the following literary devices: complex personification, dramatic foils. Written to accompany American author Lorraine Hansberry’s iconic story that brought the African American socio-economic struggles of 1950s-era Chicago to the stage, this 14-page literature study guide helps you get the most out of A Raisin in the Sun. Instead of attempting to examine every element of a book on the first reading, our study guides choose two or three respected literary devices and use them as a focal point. This guide focuses on the following literary devices: symbols, the use of dialect, the power of peripety in a story. Francie Nolan’s coming of age story just after the turn of the 20th century in Brooklyn, NY’s Williamsburg Village has touched so many readers! Written to accompany American author Betty Smith’s inspiring 1943 timeless novel, this 16-page literature study guide helps you get the most out of A Tree Grows in Brooklyn. Instead of attempting to examine every element of a book on the first reading, our study guides choose two or three respected literary devices and use them as a focal point. This guide focuses on the following literary devices: foreshadowing, motif, the theme of the Immigrant’s Dream of a better life. Written to accompany French author Brother Lawrence’s posthumous 1691 Christian text compilation, this 12-page literature study guide helps you get the most out of The Practice of the Presence of God. This book is a collection of letters and conversations by Brother Lawrence, a Carmelite monk who worked in his monastery’s kitchen. Though only 100 pages long, Brother Lawrence’s book is packed with character development concepts, including performing all tasks with a purposefully loving attitude, which are as essential today as they were three centuries ago. Brother Lawrence encourages his readers to be constantly aware of God’s presence, not limiting conversation with Him to morning devotions, but maintaining it throughout each task of the day. What great concepts for Christian teens (and adults)! This study guide focuses on the following literary device: interpretational and inferential reading. Written to accompany British author George Orwell’s 1945 allegorical novel, this 11-page literature study guide helps you get the most out of Animal Farm. Instead of attempting to examine every element of a book on the first reading, our study guides choose two or three respected literary devices and use them as a focal point. This study guide focuses on the following literary devices: allegory, dystopian satire. Written to accompany British author Charles Dickens’ beloved 1843 story, this 15-page literature study guide helps you get the most out of A Christmas Carol. Instead of attempting to examine every element of the book on the first reading, our study guides choose two or three respected literary devices and use them as a focal point. This guide focuses on the following literary devices: comparison of settings and dramatic foils. 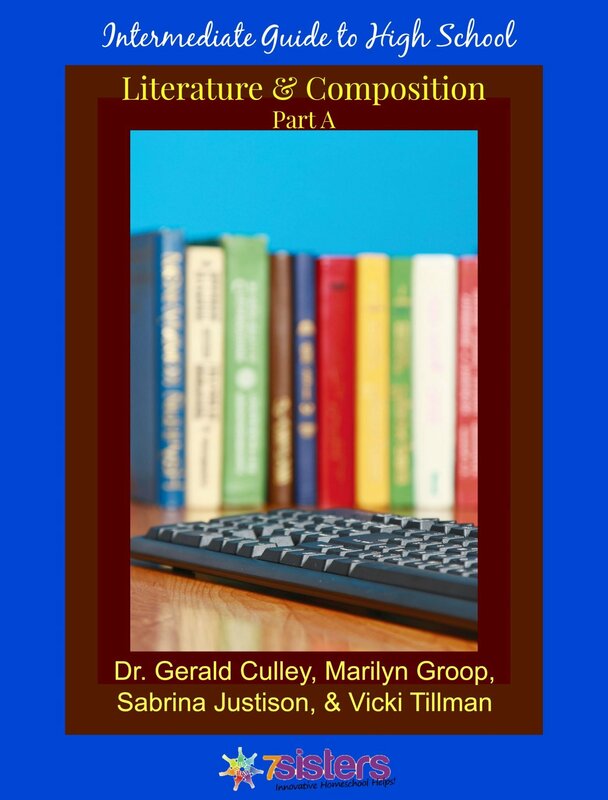 Download your copy of Intermediate Guide to High School Literature & Composition Part A today and bless your homeschool high schooler with some TERRIFIC Language Arts learning!